Thomond Park was built for big quarter-final clashes and they don't come much bigger than the visit of Toulon. The rain-enforced delay to the kick-off of yesterday's Pool 4 decider against Castres simplified matters for Munster and by half-time they had one foot in the last eight and the equation had narrowed to whether they would welcome La Rochelle or the three-time champions to Limerick. 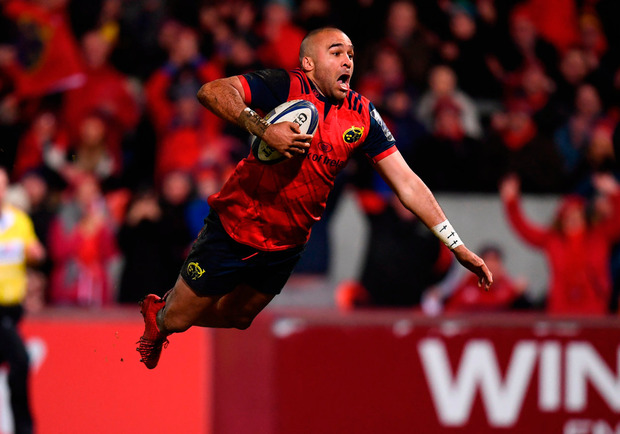 It came down to their ability to secure a bonus point, which they achieved when Simon Zebo waltzed through the French defence to score with 21 minutes remaining. Castres arrived in Ireland with something to play for, but by the time the hastily re-arranged kick-off came around they were out due to Racing 92's win over Leicester at Welford Road. Referee Ben Whitehouse deemed the pitch unplayable after a relentless night and morning of rain, but the ground staff managed to fix it up during the three-hour delay it played just fine. The French side were game for a while, but their interest faded as Munster's intensity grew and ultimately they enjoyed a comfortable afternoon. They are in for an altogether more intense outing on Easter weekend. "My initial reaction is very proud to be part of this club," coach Johann van Graan said. "I've read a bit about quarter-finals and home teams are in a very good spot to win it. "Obviously, with the home crowd, just to experience that again tonight what happened out there, the noise level, the way the people of Munster stick to this group of players and this team. "It's a lot easier to play at home. Imagine if we'd had to go to La Rochelle or Toulon or wherever. "I don't want to sound too clever. I've only been here a few weeks so it will be my first quarter-final, but I'm very, very happy that it's at Thomond Park. "I think it's a reward for the 22,000-odd people that stayed for three hours, and to see that performance from their team. "I got a bit of goosebumps before the game when the team ran around the field. It seemed a lot louder than before, and we knew this was going to be tough but once the team got momentum they got an extra few gears and I'm very happy about the home support." Van Graan has endured a tough introduction to life in the Munster hot-seat, dealing with issues beyond his control. But he has managed to get them out of a tough pool through difficult times and deserves credit. Their route to the final in Bilbao is a treacherous one. If they beat Toulon, they will return to France for the semi-final to face Clermont or Racing 92. And yet, they are showing signs of growth under their young coaching ticket despite the furore that has surrounded them in recent weeks. Munster started slowly and had to endure some early Castres pressure as both teams adjusted to the strong wind that whipped across Thomond Park. Rory Kockott put the French side ahead after 13 minutes after Jean Kleyn's tap on Antoine Tichit's head saw the penalty the Castres prop had conceded reversed. In a tighter game, the error in judgment might have haunted the South African but it faded to memory as Munster assumed full control of the game and their quarter-final destiny. Ian Keatley levelled matters after a series of strong carries started by Rory Scannell, CJ Stander and Chris Cloete, before edging his side in front after Whitehouse bizarrely pulled Conor Murray back after the scrum-half had tapped the penalty and kicked away. 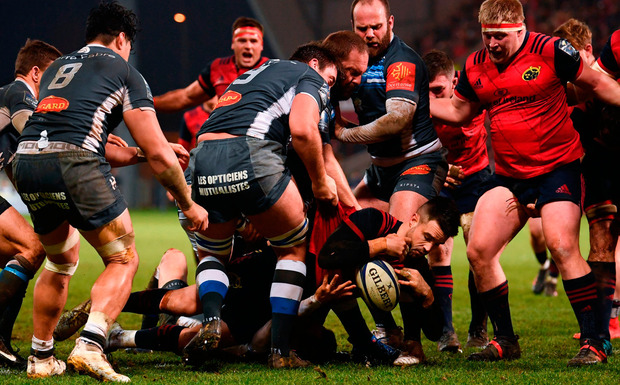 Castres could feel aggrieved for that one, but their consistent infringing under Munster pressure ultimately saw them lose Thomas Combezou to the sin-bin as the home side upped the ante. 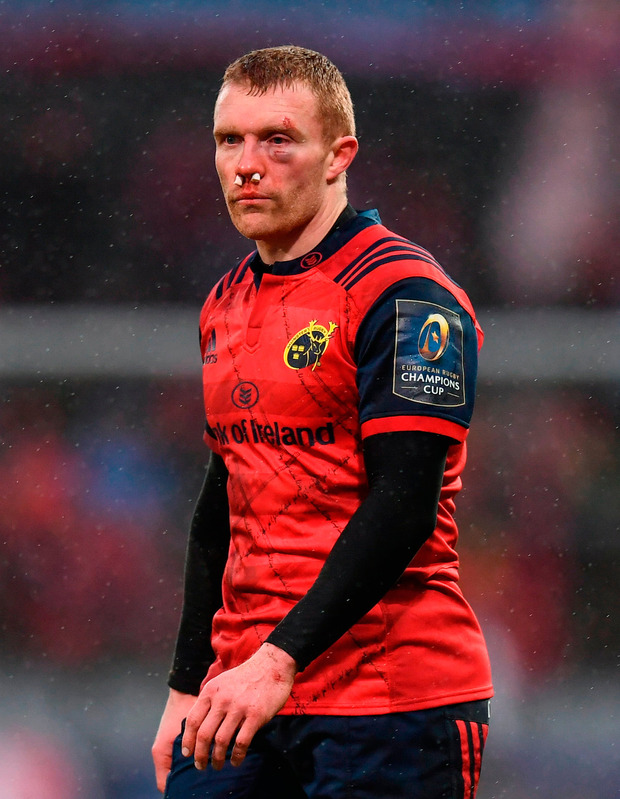 Munster went for the scrum from the subsequent penalty and when Whitehouse awarded a free-kick, Murray tapped and found Keatley who fed Simon Zebo and he showed brilliant awareness to release Keith Earls up the wing and the Moyross man wouldn't be stopped. Keatley converted from the touchline and Munster's 13-3 half-time lead might have been furthered had Murray backed himself when put into space by Chris Farrell, only to pass to Andrew Conway who knocked on under pressure from Kockott. Only Murray knows why he didn't hang on to it with nothing in front of him. Their maul made up for it within five minutes of the restart as Rhys Marshall touched down at the back of a powerful effort. Again, Keatley converted and another scrum penalty afforded Rory Scannell another chance to put the pressure on through the lineout. This time Cloete peeled around the front and took the ball to the line, but the French defence held up a subsequent effort over the line. They went again and, while Earls thought he'd bagged a second, the referee called them back for a forward pass but was playing advantage and Munster had a penalty. They went again, but Murray knocked on in the act of scoring. A scrum penalty saw Daniel Kotze sent to the sin-bin less than two minutes after coming on and again they went for the scrum and eventually forced a penalty try. That meant Munster were in a stick-or-twist situation between drawing La Rochelle or Toulon in the quarter-final, depending on the bonus point but the players played as if it didn't matter and pressed on for the fourth score. They didn't have to wait long as Earls split the Castres defence and fed Zebo who spun through the final tackle to score. Alex Wootton added a fifth as the teams played out a game long finished as a contest and James Cronin put the icing on the cake with a last-gasp maul try and JJ Hanrahan converted to bring proceedings to a close. MUNSTER - S Zebo; A Conway, C Farrell, R Scannell, K Earls (A Wootton 63); I Keatley (JJ Hanrahan 66), C Murray (D Williams 69); D Kilcoyne (J Cronin 18), R Marshall (N Scannell 49), S Archer (J Ryan 43); J Kleyn, B Holland (D O'Shea 53); P O'Mahony (capt), C Cloete (J O'Donoghue 66), CJ Stander. CASTRES - G Palis; K Jaminet, T Combezou, R Ebersohn (capt), D Smith; J Dumora, R Kockott (Y Domenech 72); A Tichit (T Stroe 46), J Jenneker (K Firmin 46), D Tussac (D Kotze 54); A Bias, T Lassalle (V Moreaux 46); Y Caballero, S Mafi, A Tulou (D Tussac 57-67) (B Delaporte 67).